20 January 2008: Ernesto Gándara Camou, Mayor of Hermosillo, México, was born on 22 September 1960 in Hermosillo capital city of the state of Sonora, in the Northwest of México. At that time his father, César Augusto Gándara Laborín, was mayor of Hermosillo (1958-1961). 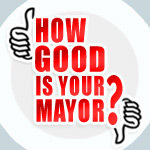 The current mayor has been short-listed for the 2008 World Mayor Award. At the age of twelve, Ernesto began to work during holidays as a dishwasher at “Hotel Gándara”, one of his father’s hotels. According to his father, he had to start from the very bottom and interact with people from all walks of life. Aged 20, after Ernesto had gone through all possible posts like bellboy, warehouse-keeper etc at his father’s hotels, he began working as law clerk since by then he was a law student at the Autonomous National University of Mexico (UNAM) from which he got the degree of Bachelor at Law. Later he obtained a Master’s degree on Constitutional Law at Paris II University. When still in high school, Ernesto Gándara joined the youth movement of the traditional Institutional Revolutionary Party (PRI). One of his earliest tasks wasto help poor homeless families who were illegally living on a private property. His first formal government job as a PRI party member began in 1991 as Head of the Unit of Information and Analysis of the Particular Secretary of the Republic’s Presidency. He then was appointed to a number of posts at state and federal level including Federal Deputy of the Department of the Environment, Natural Resources and Fisheries in Sonora State (1995-1998); Advisor of the Administrative Head of the Treasury Secretary (1998-2000); General Director of Petitions and Hearings of the Republic’s Presidency (2000-2003); Particular Secretary of the Governor of Sonora State (2003-2004) and; General Coordinator of the Promotion of Tourism Commission of Sonora State (2004-2006). Ernesto Gándara took office on 16 September 2006 for a three-year period as Mayor of Sonora state capital Hermosillo, a city with a population of some 700,000 inhabitants. PUBLIC SECURITY: By increasing the training of police officers and providing them with greater motivation, crime fell by 38 per cent in one year. The mayor provided officers with improved life insurance cover and gave school grants to their children. He also increased funding for the fire brigade by 25 per cent, allowing them to buy new vehicles and fire-fighting equipment. PUBLIC SERVICES: Some 37 of the 57 illegal rubbish dumps have been shut down; Nine kilometres of pipes and drainage network have been repaired; pavement and electrification works have been carried out in popular areas of the city, schools, public buildings and sport fields. SOCIAL DEVELOPMENT: The mayor has given 1,567 education grants; allowed the purchase of 12 school busses for children in rural areas; Three million rations of school breakfasts; 52 self-employment courses in rural and urban communities; he has reached agreements with private associations for Arizona’s ophthalmologists to treat low-income families as well as with the Red Cross to provide 1500 medical services at low cost, and; he has managed to integrate 91 street children into the assistance centre given 118 school grants and job training. URBAN DEVELOPMENT: Includes the remodelling of the Municipal market and the rejuvenation of the city’s centre; the connection of boulevards to improve traffic, and; works on drainage to avoid floods. ECONOMICAL DEVELOPMENT: The creation of fiscal incentives; support to the creation of conditions for investments and the creation of new businesses and job sources. The main achievement of Ernesto Gándara as Mayor is perhaps that due to the public works and repairs of the drinking water and sewers networks, for the first time in many years there was no need to distribute water by stand pipes during the summer of 2007, Before Mayor Gándara Camou’ administration, in summer Hermosillo inhabitants had only water for four hours a day. Aiming to find a long-term solution to the water shortage, the aqueduct El Molinito is being built. Ernesto Gándara Camou is married to Pili Madrid with whom he has 3 daughters.